I have a confession to make. Folks here who’ve been paying attention down here could probably figure it out, but it’s not the kind of thing you ask someone. Yes, I’ve been disappearing right after work and not getting back to the Jamesways until late at night, arriving with an unmistakable scent on my clothes. I’ve been dragging myself into work just in time each morning, groggy from too little sleep, but with a dreamy look in my eyes. I’ve been glancing more frequently at the clock when 5:30 approaches, eager to dart off somewhere. The people who know are divided – some think I’m crazy, some just smile and slap me on the back with a wordless “attaboy”. Yeah, I’m sleep deprived, but it’s worth it. I don’t think I’ve felt anywhere nearly so fulfilled, and so much like I’d found my place here since I met Cassie. Cassie’s been here longer than most Polies. She’s just shy of 30 years old and came to Pole after a stint with the Navy. Folks who work with her swear at her, swear by her, and well, just tend to swear a lot. But they can’t get through the day without her. She’s gruff, noisy as all hell, and cantankerous as anything if you try to get her up before she’s ready. And believe me – “cantankerous” takes on a whole new meaning when you weigh 19,310 pounds. 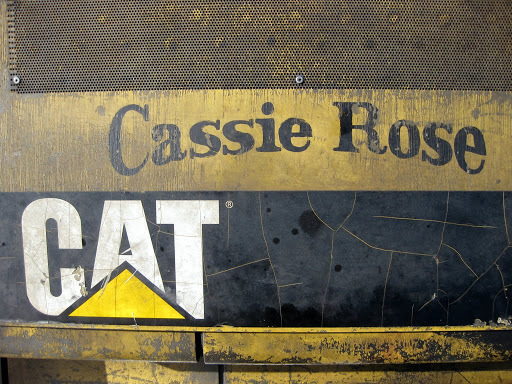 You see, Cassie is a Cat 935 front-loader, and for the past week or so, I’ve been moonlighting with the cargo team. 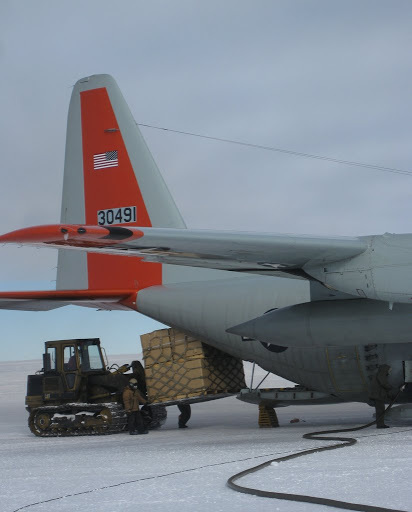 Starting around 7 p.m. each day, I’ve been throwing on my Carhartts and slipping out of the Station to join Jared, Bryce and Tamra for an evening of building pallets, forklifting loads, marshalling planes, and dragging cargo. For a guy whose day job is sitting behind a desk and waiting for people to need help with their email, there’s something deeply satisfying about being able to get outside and really strain your muscles a bit. To feel the cold, at least a little. To drag stuff around. 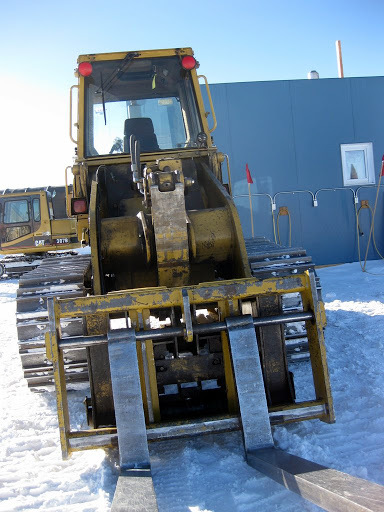 To yank a couple tons of Antarctic cargo into the air with an antique diesel-snorting front-loader. 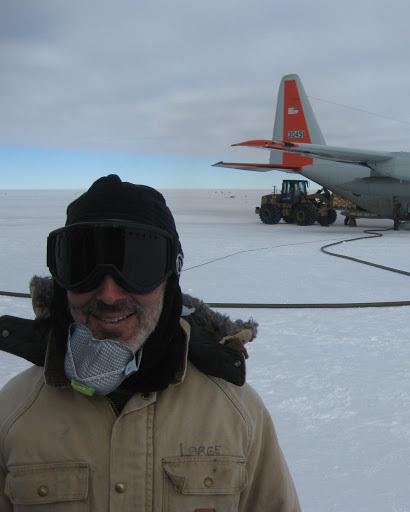 To stand directly in front of a massive C-130 that’s just landed at the freaking South freaking Pole (of the world), and guide him to safe parking in the swirling snow. To remember, viscerally, in my frozen fingers and frosted-over goggles that I actually live here, at the fSfP (otw). 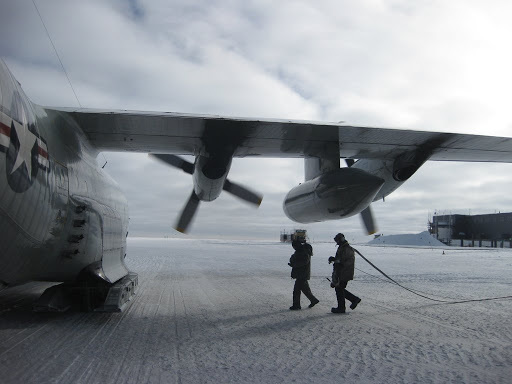 And to come home cold and exhausted, smelling of jet fuel, eager to do it again. Mind you, I’m not pulling anywhere near a full second shift. Bryce and company work swing, from 3:00 until after midnight. I’ve got to be at my day job from 7:30-5:30, so I’ve just been joining them right after their “lunch break” (my dinner) and working until 10 or 10:30. Yeah, I’m tired in the morning, but it’s so worth it. Scrabble? Movie night? Idle conversation in the galley? Thanks, but for now, I’d rather be spending my evenings with Cassie and her friends. Inquiring minds (and nosy friends) want to know – how did you end up with that gig? Oh, it's pretty easy: you show up and say "Want some help?" Everyone's shorthanded here, so as long as you don't look like you're going to cause more harm than good, most folks are grateful for the extra hand.Lots of people also moonlight to build experience for future seasons. 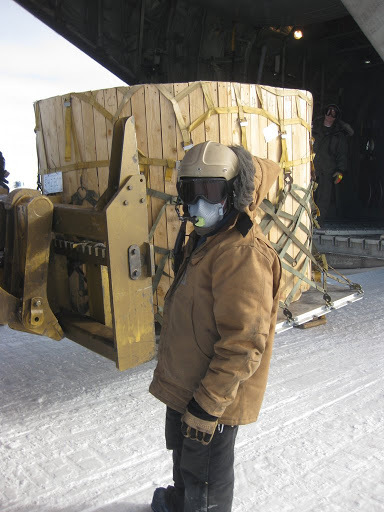 If, for example, I was hoping to come back next season on Cargo team, volunteering now gives me a bit of experience to make me more hireable, lets me know what it's like, and most importantly, lets the Cargo folks know whether they'd like me on the team.